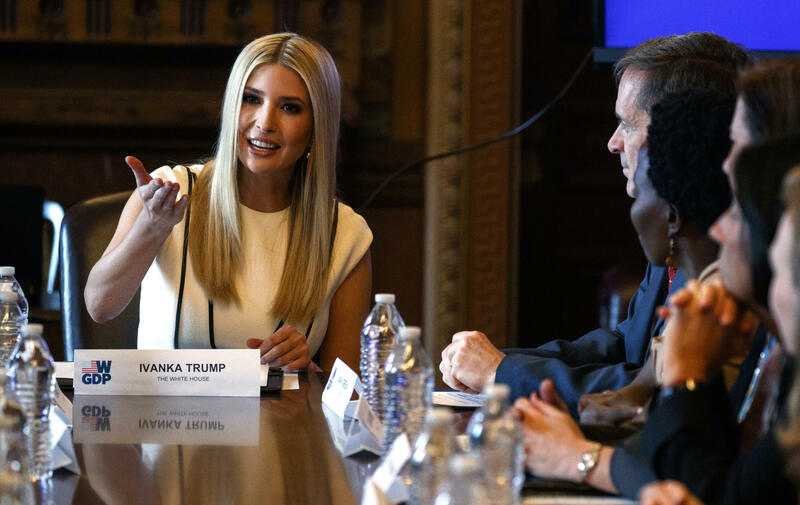 Ivanka Trump speaks at a roundtable for the Women's Global Development and Prosperity Initiative at the White House on February 7. First daughter Ivanka Trump wants to help 50 million women around the world "realize their economic potential" by 2025. Experts who work with women's issues in the global development community are hopeful about the new initiative – but raise questions about the timing of the announcement and the lack of specifics. Trump, a senior adviser to President Trump, announced the Women's Global Development and Prosperity Initiative last week in an op-ed for the Wall Street Journal. It aims to get all U.S. foreign assistance agencies – including the U.S. Department of State, the U.S. Agency for International Development (USAID), the Millennium Challenge Corporation, the Peace Corps and six others – to give top priority to push for women's economic development. And it sets up a $50 million fund for USAID to invest in new programs that can help make it easier for women to find jobs, start their own businesses and do business. A White House press conference about the initiative identified the range of women who might be helped, from a dairy farmer in Georgia to the founder of a women's group in Malawi. "This new initiative will for the first time coordinate America's commitment to one of the most undervalued resources in the developing world – the talent, ambition and genius of women," Trump wrote in the Journal. In a memorandum, President Trump said the initiative will build on his administration's "growing portfolio" of women's economic empowerment programs, including the "Ivanka Fund" – a World Bank project that she created to award grants to development banks to support women entrepreneurs around the world – and other efforts at USAID and the Overseas Private Investment Corporation (OPIC). The initiative has three main focuses, or "pillars," as the administration calls it: providing women with the education and skills training they need to enter the workforce; helping them succeed as business owners through financing, access to markets and networks; and addressing other barriers – legal, regulatory and cultural – that keep them from working. According to the World Bank, 2.7 billion women in 112 countries are legally excluded from certain industries, like mining and construction or other jobs deemed "morally inappropriate," like serving alcohol or working in casinos. It's also legal in 18 countries for husbands to prevent their wives from working. The presidential memorandum calls on U.S. foreign assistance agencies to dedicate at least $300 million annually to programs that advance the three pillars, while the $50 million USAID fund will finance additional programs. The initiative also plans to advance its goals through partnerships with non-governmental organizations and private companies, like Pepsi and UPS. Nancy Lee, a senior fellow at the Center for Global Development and a former U.S. Treasury official, says the initiative could be truly transformative if it actually brings women's issues to the forefront of all development efforts – whether that means including women in the efforts of farmers to bring food to market or inviting them to be leaders in a peace-building efforts. "At USAID, we're thrilled," said USAID Administrator Mark Green at a press briefing last week. "We've been working on women's empowerment, but now we have an across-the-board interagency effort, the full force of the U.S. government behind this." But some — especially development experts who have designed such initiatives — are concerned that without specific goals and more details, it's just a political show. "All I've seen about this initiative is a whole lot of generic talk of the importance of empowering women without actually setting out a plan or a clear roadmap how to get there," says Brett Bruen, president of the Global Situation Room and former director of global engagement in the Obama administration. He believes the initiative is just a way to enhance the administration's reputation ahead of the 2020 presidential elections, especially in the wake of cuts to global women's programs from the Trump administration. Last year, President Trump proposed a 35 percent funding cut for global gender-equality programs, though Congress eventually rejected the cuts. The Trump administration has also reinstated what's known as the global gag rule to block U.S. aid money from funding any organizations that perform abortions, offer information about the procedure or support more liberal abortion laws. Development experts, on Twitter and beyond, say that if this initiative must address topics like reproductive rights and health or else women will not have the freedom to fully participate in the workforce. It has not yet been disclosed what kind of proposals will be submitted by whom for the benefit of which 50 million women. Even if USAID targets the most vulnerable women in developing countries with that fund, so far, there have been no official public stipulations to ensure that they – not elite women in those countries – will receive the rest of the aid. "Making sure that the poorest and most marginalized populations are reached is a critical piece of this initiative," says Aria Grabowski, senior policy adviser for Oxfam America. "We're hopeful that it will target some of the women who need it most."